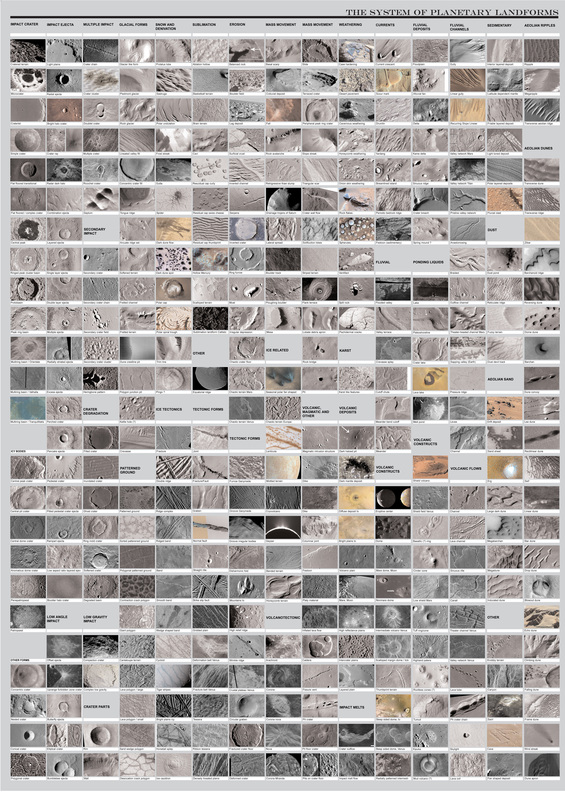 Download our latest poster that features planetary landform types from A to Z, almost 400 different landforms from all over the Solar System. The images are from the Encyclopedia of Planetary Landforms where you can find review articles about each landform type. It is not common to find new and creative design in planetary cartography, a field where most maps follow the standards, and unique map design is the last thing to think about when publishing a paper. So we are happy to report a poster displayed at the American Geophysical Union Fall Meeting that is a fine work of cartographic art. The poster layout of Byrne et al. 2015. The poster was on display the day of the Star Wars: Episode VII premiere, so the timing couldn’t have been better. We had seen several Star Wars-themed fonts in the huge poster hall of the AGU meeting, but none so coherently designed as this one. Global map of smooth plains of Mercury from Byrne et al. 2015. While most global planetary maps are in a standard Equirectangular projection, the map created by Paul Byrne is in the Robinson projection, which avoids significant visual distortion approaching the poles and enables the flat image to more closely resembles a familiar globe. The poster was made in Adobe Illustrator, with base maps exported from ArcGIS. The minimalist design characterizes both the map and the poster, using all elements of the layout, the fonts, the colors, and the nomenclature to create an organic visual experience: the place-names are either all lowercase, or all caps, reflecting the typographic principles of the Bauhaus movement in the 1920s which set sans serif as the new standard. However, the main text is set in Gotham, a “very American” type of Sans Serif, designed in 2000, connecting planetary science and Star Wars with American pop culture at the dawn of the Space Age. Detail of a two-hemisphere thematic map of Mercury from Byrne et al. 2015. This orthographic map is centered 30°S, 47°E and the spacing of the coordinate grid is 10°. As a result, there are no straight lines in the grid. Note that there are only four grid values displayed, making it unambiguous and at the same time not crowding the map with numbers. Note the curved leader lines. The choice of color is also minimalist, coherent, and the best choice for high precision color printing. The poster uses six colors in total: all four colors used in color printing (cyan, magenta, yellow and black) plus two secondary colors that don’t require halftoning (red – yellow and magenta, and blue – cyan and magenta). “I like the retro aesthetic of curves in lines, and I also like the idea of a polished, grid-like floor reflecting the poster content hovering above it” -says Paul Byrne. “Above all, I want my posters to stand out and pique the audience’s attention—something that’s hard in a poster session with hundreds of presenters—and so I try to compose them in ways that are striking and eye-catching”. The poster as it was on display at the AGU Fall Meeting, Dec 18, 2015. The tinsel is to catch the attention – last year Paul had lights arranged around his poster. Here is another well designed map, from LPSC 2016. Byrne et al. 2016.